The site of Knox College, at One Spadina Crescent, seen from above. Up front, the old Knox College is all Victorian adornment, an array of gables, turrets and lancet arches. But around back it has a very different vibe. A long, flat glass façade pulls in northern light. Green roofs feed on rainwater. Zigzagging concrete forms say, in their own language: Welcome to 2017. These two sections, old and new, form a new home for what is arguably the country's leading design school, the University of Toronto's Daniels Faculty. The 156,000-square-foot centre will house, as of this fall, programs in architecture, landscape architecture, urban design and visual studies. The new wing behind Knox College, viewed from Spadina Avenue. 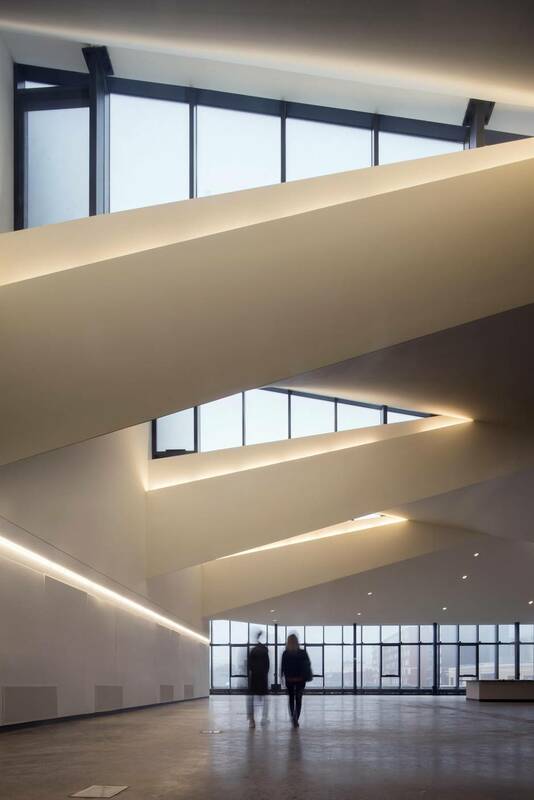 The Daniels Building's design was led by the firm NADAAA, with the surrounding landscape by Public Work, and it will open for a preview during the Doors Open festival this month. After years of complex construction, it's not quite done (and the school is raising the last portion of $36-million in donations ). Yet it is already spectacular – one of the best buildings in Canada of the past decade, rich with arguments about how contemporary architecture, landscape and urbanism can work with history and build the city of the future. And it has to be full of ideas. This will be a place where people learn how to design buildings, landscapes and cities. Plus it's meant to welcome the public, including a central passageway that links this university campus to its downtown neighbourhood. "It's a university space, but it's also a civic space of the city," says the lead architect, Nader Tehrani of NADAAA. "By creating a space and prospect" – a view – "where there hadn't been one before, it extends the public imagination." How can a piece of architecture do all that? An exterior view of the new addition, the forms of which respond to those of the 1875 Victorian Gothic original. The project begins with the 1875 building, designed by Smith & Gemmell as a Presbyterian seminary on the edge of Toronto. The Victorian gothic pile later took on other purposes – a military hospital, medical laboratories and then as miscellaneous purposes for the University of Toronto. On the western edge of the university's current campus, it held mouldering old fridges and was splattered with art students' old paint. "There was this … indescribable smell," says Tehrani's partner, Katherine Faulkner, with a laugh. In short, it was a serious fixer-upper. But the scheme by NADAAA in collaboration with heritage architects ERA and architect-of-record Adamson Associates left its smallish, rectangular rooms in place for use as offices, classrooms and a library. The faculty's dean, Richard Sommer, explains: "If you have an old building, you have to ask, 'What can it do well?' And for everything else, you look to a new building." What did the school need? Sommer answers with a simile: "We've been like a theatre company that never had the right space to put on its performances," he said. "The new building is a great theatre that allows us to put on a much bigger show." The ceiling ripples with angular protrusions, opening up for diamond-shaped skylights. If you know how design schools work, this makes perfect sense. A crucial part of the learning process is the "review," or "crit": students present their design work to a panel of invited guests who draw them out, challenge them, push for deeper ideas and clearer explanations. There's a highly theatrical aspect to this process. And the new stage – actually, several stages – will be big, flexible and spectacular. They're located in the new wing, tightly insulated and served by efficient radiant heating and cooling systems. A tall lecture hall sits right in the centre, cutting east-west between wings of the old triple-brick building. North of that, two broad, open design studios look north through that new glass façade; below them, the ground is carved away to reveal labs where students can fabricate models and objects. When I toured the facility recently with Tehrani, it was still in the chaos of construction, but the vision was clear. The new spaces are pierced and interconnected by stairs and skylights. The result will be a sequence of rooms with remarkable spatial complexity. Tehrani offers another metaphor: "The building is a piece of landscape," he said, speaking over the whine of a table saw, "that is contorted to bring light and to bring social relations together." A reading room in the old Knox College will be open to the public. Architects go overboard with metaphors, but as we stood in the third-floor studios, one made obvious sense. The ceiling above rippled with angular protrusions, opening up for diamond-shaped skylights, and it reached a full 34 metres without ever touching down. All the heavy masonry of the old building and the concrete of the new one disappear. The street reaches north, a vector of the city that seems to begin right below you. If you're an architecture student, you will wonder how this is done, and the answer is two long assemblies of steel that reach out from either side, meeting at a little peak that diffuses the forces on the building. It also serves as the high point for rainwater, which is carried two ways along a central axis and down into cisterns, which will hold water for irrigation. "This integration of all of these strategies is a narrative that works on the scale of the building," Tehrani explains. The point of the roof also echoes the old Knox's picturesque quality. 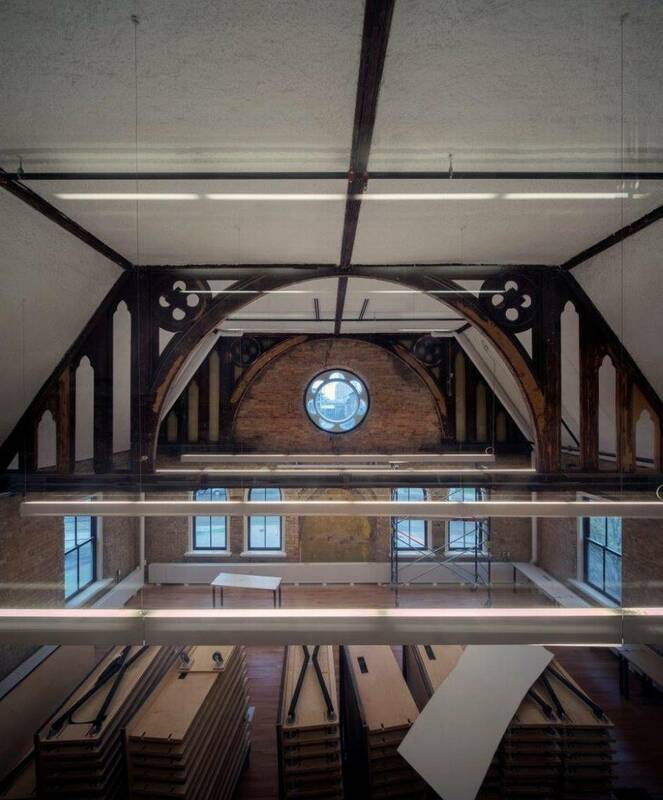 The old building has been artfully cleaned up – it looks amazing, with old hardwood and plasterwork restored, and high-performing new windows – but the new building establishes a conversation with it. "The gothic skyline of the building presented a challenge for us," Tehrani says. "That is: How do you not mimic the existing building, but speak to it in a corresponding way?" Their answer has been to capture its geometric exuberance and express it in contemporary language, with spiky concrete protrusions, panels of ultrahigh-performance concrete laid like shingles and a new landscape around the building that both dips and rises, linking to the structure in terms of drainage, use and form. In contemporary design, architecture and landscape architecture are increasingly linked. That connection is visible here, and the green areas around the building, which will rise to cover several small pavilions, will also provide a site for the school's landscape architects to study green roofs. Within Toronto, it's hard not to see the building as a symbol, thanks to its unique site. It sits in a circle in the middle of Spadina Avenue, one of few streets in the city that was conceived with ceremonial character. William Baldwin, the doctor-lawyer-politician, laid it out in the 1830s to cut through his family's landholdings as a grand avenue. "Someone recently observed to me that the old collegiate gothic building at the head of Spadina was a symbol of the old, uptight, Anglo-Saxon Toronto, and that the new addition represents the new, more cosmopolitan Toronto," Sommer says. "Maybe so." And yet Spadina Avenue, as he points out, was also "a spine of immigration," hub of the garment industry and, for half a century, of Jewish Toronto. The development industry that built Toronto after the Second World War was filled with Jews and Italians, immigrants or their children who were less than welcome in WASP Toronto society. And now one of them, architect and developer John Daniels – who arrived in Canada at 12, speaking no English – has put his name on the old Knox College. Things change. The new spaces are pierced and interconnected by stairs and skylights. And that is the central lesson of this bold project. A structure that has been a seminary, a hospital and laboratory can – and probably will – become something else. Accordingly the people conceiving it didn't insist on predicting the future; the university's space-planning professionals wanted to allocate every square foot to a particular purpose, but, Sommer says, the faculty is ready to adapt to the old building and keep re-examining the new one. "How we work is going to continue to keep shifting," he says. The building will "remain in a state of becoming," he argues, "a kind of scaffold on which to experiment." That is, to explore and to build the city of the future.